Growing up surrounded by a close Sephardic family, I often heard stories of life in Brooklyn where my mother and her siblings lived with their Turkish immigrant parents. Both of my grandparents cooked and baked, my Nona and Nono equally comfortable in their small kitchen and their basement which had a large table and a stove. My mother always said they had bendichos manos, blessed hands. They could take a bag of beans and create a meal that was so delicious, everyone cleaned their plate using the crisp fresh Greek bread to soak up the last drops. One of our favorite meals growing up was fijones, beans, cooked tender and thick and served with red rice (arroz con tomat). Each time my mother brought it to the table, she talked about this being a typical meal in her childhood home and how on Shabbat her parents added marrow bones to make the meal as special as the Sabbath. One of my great aunts used to say, “Meat is money and a meatless soup means money in the bank.” This is a hearty meal with or without meat; it fills the house with a wonderful aroma and the body with sustenance. It’s an inexpensive option for these cold winter nights. Enjoy this and make it your own by adding carrots or celery (or your vegetables of choice) and/or other spices. Maybe it will become a part of your family history. After all, stories added to a meal are the secret ingredient for a special taste. Heat oil in the bottom of soup pot. Brown chopped onions (also brown the marrow bones with the onions, if using them). Add water and tomato sauce or paste and bring to a boil. 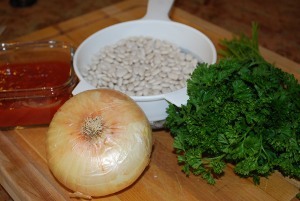 Add beans (no need to soak), chopped parsley and bring to boil again. Lower heat to a simmer and half cover. Cook 2 hours until beans have begun to soften. Add salt, pepper and cumin to taste. Add a little more water if needed. Cook another 1 1/2 to 2 hours, low heat, until all flavors are blended. and meal is flavorful. Can be served with white or Spanish rice. Heat oil in pan and lightly brown rice on low flame. Add all other ingredients and bring to low boil. Stir and cover and lower heat to simmer. Do not stir again until water is evaporated, 20 minutes. When cooked, use a fork to gently separate grains of rice. Serve side by side or under the beans.